Jim Collins might not have envisioned a long and successful career in higher education when he enrolled in his first classes as an undergraduate mathematics major at DePauw University (BA ’63). But thanks to a series of opportunities that put him on that path – and provided new expertise areas – that’s exactly what happened. After choosing a mathematics major, obtaining certification to teach at the high school level was an obvious choice. Teaching appealed, and Jim looked forward to the opportunity. At the same time, advisers at DePauw encouraged students to consider graduate school as a next step in their educational journey. 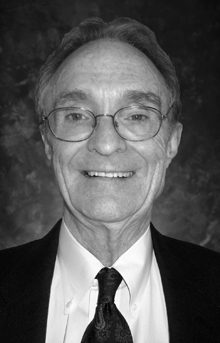 Collins did that and received a graduate assistantship from Arizona State University (MA ’65, mathematics). Jim honed his math skills further there and experienced teaching for the first time. Collins took on teaching appointments at Ohio University (Athens, Ohio) and Arapahoe Community College (Littleton, Colo.) after completing his master’s degree. The latter assignment brought Jim to the Rocky Mountain area and the chance to teach at the community college level, a niche that he says was particularly attractive. College administrators encouraged him to continue his own education, via additional course work at colleges in the area. He followed that advice, joined a grant-funded researcher training program at the University of Colorado, and graduated with a PhD in education in 1970. A desire to remain in the Rocky Mountain region led Collins to Laramie and the UW College of Education in 1970. The Collins family left in 1972, when Jim joined the University of Missouri-Kansas City faculty. But their hearts – and the rest of Jim’s career – were in Laramie. Collins returned to UW in 1974. At UW, he taught statistics and research methods courses for graduate students as well as measurement courses for undergraduate education majors. A popular teacher known for translating challenging concepts in accessible ways, his graduate courses drew students from across campus. Collins also held adjunct faculty status in the UW Department of Statistics. The university recognized his impact on students and instruction when it presented him with the prestigious John P. Ellbogen Meritorious Classroom Teaching Award in 1979. While mathematics was his focus, a series of corporate and university opportunities led Collins to a deep interest in the role of computer services at UW where he served on the UW Computer Committee for a number of years. Jim answered when the College of Education called him to higher responsibilities. He served as head of the Department of Educational Foundations and Instructional Technology from 1981-1985. He also chaired the Division of Leadership and Human Development from 1991 until 1993, when he moved to the college’s executive suite as dean. Collins fulfilled that significant leadership role until his retirement in 1995. Jim has five daughters and six grandchildren. Retirement has been anything but quiet. Collins and his wife, Norma Lynne, returned to Boulder, where they have immersed themselves in community life and pursued old and new interests.